Lancashire County Council will be celebrating this year’s National School Meals Week, from Monday 12 to Friday 16 November. Now in its 25th year, the initiative is run by the Lead Association for Catering in Education (LACA). National School Meals Week celebrates the importance of school meals, and of children being provided with a hot and nutritious lunch. To start off the regional activities for the week, on Tuesday 13 November Woodlands Community Primary School in Skelmersdale will host a National School Meals ‘on the road’ day. Children will take part in various events and exercises along five themes of education, concentration, attainment, energy and nutrition. County Councillor Susie Charles, Cabinet Member for Children, Young People and Schools, said: “We’re involving the children in various activities to teach them about nutrition and the benefits of a healthy, balanced diet. Activities for the week include a Fleetwood school cook helping to prepare meals for the lunchtime diners at the two Michelin star L’Enclume restaurant, in Cartmel. L’Enclume has two Michelin stars and five AA Rosettes. Paolo Loparco, who works for Lancashire’s school catering service at Charles Saer Community Primary School in Fleetwood, will cook alongside haute cuisine chef Paul Burgaliere, at the fine-dining restaurant on Thursday 15 November. L’Enclume is owned by internationally renowned chef Simon Rogan. Paolo will also visit Simon’s Rogan & Co restaurant nearby. The itinerary for the day also includes a tour Our Farm, which supplies the majority of fresh ingredients for Simon’s restaurants. Paolo will help the farm manager Donald Macrae to gather food for the restaurants. This opportunity forms part of this year’s National School Meals Week ‘Host a School Chef’ programme. 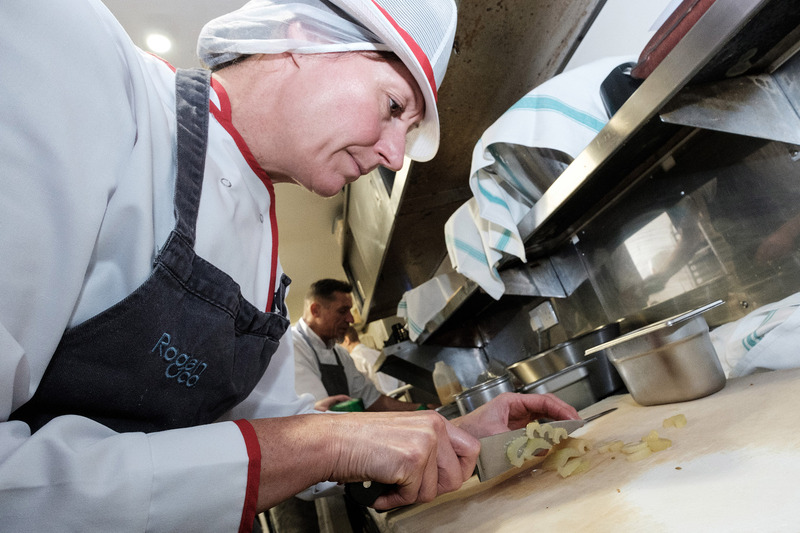 Now in its fifth year, the scheme offers school cooks the chance to spend a day working with some of the most talented chefs in the catering industry, in some of the most famous restaurants in the country. County Councillor Charles said: “This is a fantastic opportunity for Paolo. It is a great chance for him to improve his own skills, and share the knowledge he gains with his colleagues at school. Cook Paolo Loparco, said: “I’m really looking forward to joining the high quality chef at L’Enclume. I’ll also get the chance to visit Rogan & Co. This really is a tremendous opportunity for me to learn from the best. Thousands of pupils and their guests will be tucking in to what might be the country’s largest-ever school dinner on Thursday 15 November. Also as part of National School Meals Week celebrations, over 50,000 Lancashire primary school children will be sitting down to homemade chicken, sweet potato and coconut curry with all the trimmings, or a vegetarian pasta dish, followed by homemade chocolate and mandarin cheesecake. Curry was chosen for the meal following it being voted the nation’s favourite school dish in a recent online vote. People were asked to name their favourite school meal over the past 25 years. Curry was voted the top dish from a shortlist of 10, with school cooks being encouraged to put it on their menus during the week. County Councillor Charles added: “School lunches are great these days, healthy and tasty, and planned to comply with nutritional standards. “The week deserves to be a great success and I’m sure it will be. Our school meals and kitchen staff work so hard to produce nutritionally balanced meals that children will love. More information about the participation of the Schools Catering Service in this initiative is available from Alison Ashton, food and workforce development manager, by calling 01772 539923, or by emailing alison.ashton@lancashire.gov.uk. More information about the national scheme is available at www.nsmw.org.uk. The week is sponsored by Kraft Heinz Foodservice.